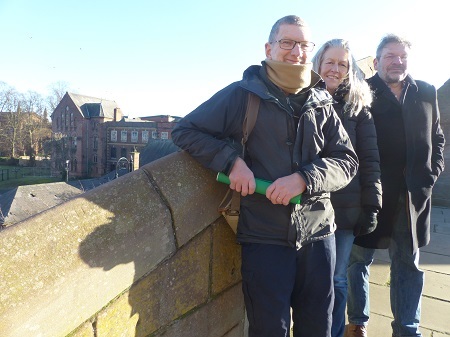 This was the joint message of two archaeological experts to Chester Growth Partnership’s Dee House and Amphitheatre Working Group at its second meeting. The working group is meeting monthly until June 2019 to consider all the facts and reach a collective conclusion on the best options for the future of Chester’s Dee House. Each meeting is focusing on a different theme. This month’s meeting presented information on the findings of the Amphitheatre Project and how this impacts on Dee House’s future within the context of its surrounding area. Dee House is a small ‘country house’ and plays a significant role in Chester’s history. As an area, St John’s, with its outstanding Norman cathedral architecture surrounded by its precincts, which included the amphitheatre, Dee House and the Bishop’s should be celebrated as part of Chester’s long heritage. Tony Wilmott, a senior archaeologist with Historic England, Co-Director of the Chester Amphitheatre Project and co-author of the first volume of the Project findings, said: “The excavation demonstrated that the preservation of the amphitheatre fabric was very poor, and not capable of display, but the archaeology of the site remains nationally important. “The architecture and history of the amphitheatre is very well understood, and little more information on this phase of the site can be gained from further work. The most important field for future research should any further excavation take place is the middle Saxon period and not necessarily within the amphitheatre. Professor Stewart Ainsworth, of University of Chester, a former senior investigator with English Heritage and well known landscape archaeologist with Channel Four’s Time Team, said: “Dee House is a building of major historical and archaeological importance and is a prime asset which should be preserved for the future of Chester. “The Roman amphitheatre and Dee house are part of a unique urban landscape which encapsulates over 2000 years of Chester’s history. Although the amphitheatre is arguably its most high profile component, excavations have shown that this was only used for 80 years or so of the site’s 2000 year old heritage. We need to appreciate the value of Dee House and its legacy. The working group membership includes representatives from the Chester Growth Partnership, Cheshire West and Chester Council members from across the political spectrum, the Chester Archaeological Society, Chester Civic Trust, Chester Attraction Partnership, , Big Heritage, Dig Up Deva, a Chester University archaeological student, Cheshire West and Chester Council officers, and Historic England in an advisory capacity.